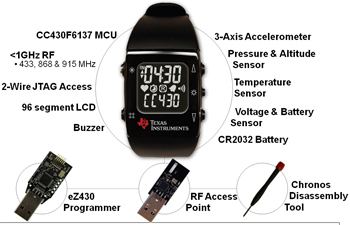 The Texas Instruments product management team knew they were on to something as they prepped for the November '09 launch of the eZ430 Chronos low-power wireless MCU development kit, but they had no idea that within weeks it would surpass the 5,000-unit mark and in doing so leave previous kit-launch records in the dust. "We knew we had a hit," said Adrian Valenzuela, TI's MSP430 marketing manager, "but this has far exceeded our expectations." The previous record was 1,000 kits in that same timeframe. The kit itself (view full presentation here) has a host of advanced features. It's based on the company's CC430 low-power wireless MCU and includes a three-axis accelerometer, temperature, pressure and altitude sensors, voltage and battery sensors, a two-wire JTAG interface, 96-segment LCD and a buzzer. It's also supported by a complete hardware and software development community. All are excellent, but what separates the kit from its TI predecessors, or any such kit to date, is its form factor: it comes as a fully functional sports watch for $49.